Along with OS X Yosemite, Apple has just released iTunes 12.0.1. It can be downloaded from the Mac App Store or directly from this link. 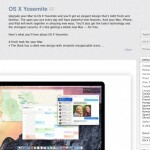 While the software is designed for the latest version of OS X, it can be installed on any Mac with OS X 10.7.5 or later. The software features a flatter and more modern look. Here are the complete release notes. One of the more interesting changes looks to be a more seamless browsing experience between your library and the iTunes Store. 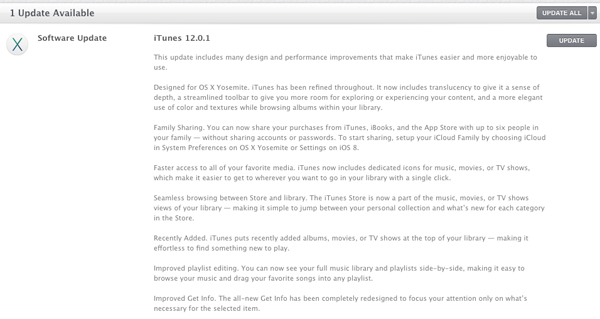 With iTunes 12.0.1, the store is now a part of the music, movies, or TV shows view of a library. Recently added media will now also appear on the top of your library. The software offers a number of features compatible with Yosemite and iOS 8 like Family Sharing. Users can also take advantage of improved playlist sharing. Finally, the Get Info feature has also been redesigned.